This is a recipe from from Tarla Dalal website. The pizza with this base was a hit. Check the recipe of Pizza here. And the pizza base tasted like Kulcha (when I searched for the recipe for Kulcha, it was almost similar, hence the taste was similar too)!!! We even tried it with Chhole. 1) Take half cup warm water and dissolve sugar and yeast into it. wait till it gets frothy (4-5 mins). If it doesn’t get frothy then the yeast is not active, use another packet of yeast. 2) In a mixing bowl (or paraat/kathrot) take whole wheat flour (or all purpose flour if using), add salt, mix well. Using the yeast, sugar water knead the dough. Add extra water (warm) as needed. the dough should be a little sticky. 3) Now grease your hands using olive oil and knead the dough till it is elastic. Slap it to check if it is elastic enough!!! 5) Once it doubles in size, punch the dough in the center to remove any extra air. 6) Meanwhile, preheat the oven to 150 degree C.
7) Take a greased baking tray, on that make pizza base (the recipe says roll, but i used my hands to flatten it) from this dough. 10) Bake in the preheated oven at 150 degree C for 7 mins..
1) First time i made it i used All purpose flour/Maida, but next time i made it using whole wheat flour. The pizza was delicious but as kulcha it was not great. 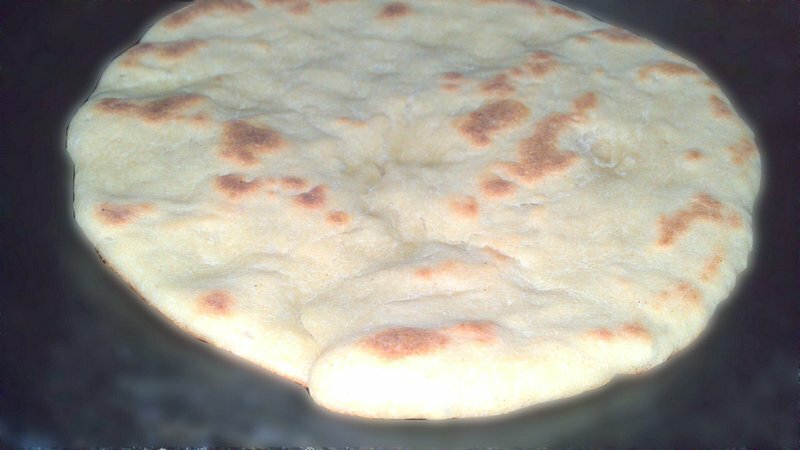 So if you are planning to make kulcha from the leftover dough then use maida. 2) You can make Kulcha directly on the tawa the way you make paratha (but using little oil). Chocolate, Peanut butter and dates milkshake - Ramadan Recipe - Guest post for Huma.. The Click Happy Group | Let's improve our food photos together! !